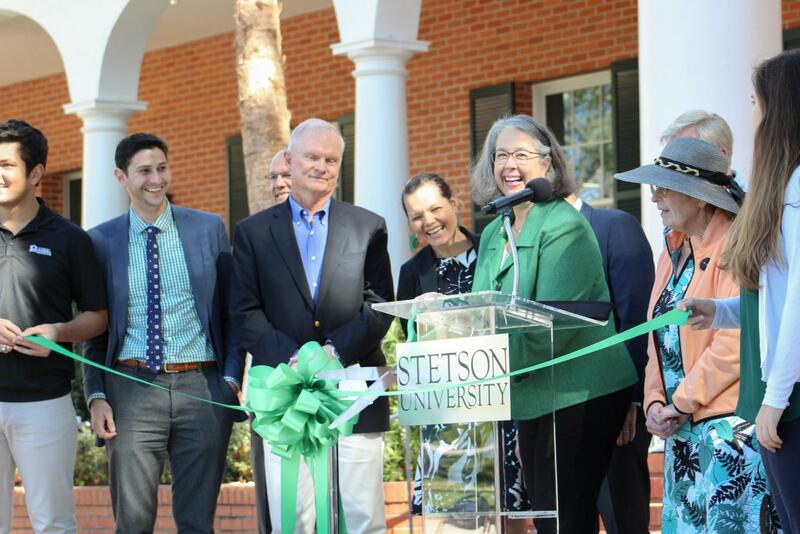 President Wendy Libby cuts the ribbon during the ceremony announcing the completed Carlton-Union Building. When President Libby went up to the podium outside of the newly redesigned Carlton Union Building (CUB) to give her welcome address, her eyes shone with pride; she and her husband had been waiting for this day since 2008. Nearly 11 years later, on Friday, January 18th, faculty, students, alumni, and board members joined President Libby outside for a ceremony to honor both the building and the people who helped make the restoration happen. 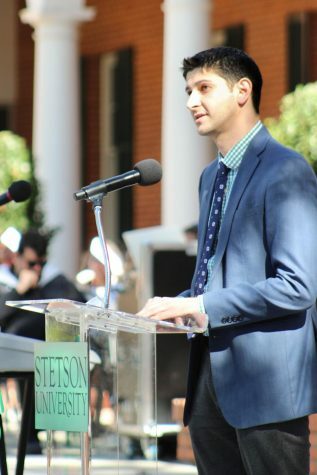 “With the new CUB, a new journey has now started,” alumnus and former SGA president Andrew Glasnovich (‘09) said. Thought of as the “heart and living room of campus,” the CUB, originally built in 1957 to honor alumnus and former Florida governor, Doyle Carlton, Sr. (1909), reopened at the start of the spring semester. The ceremony featured speakers ranging from donors to the architects. Featured is alumnus and former SGA president Andrew Glasnovich,‘09. This renovation expanded the CUB by 48 percent, from 52,000 square feet to 86,584 square feet, and enhancements of the new building include more student lounges, study and meeting spaces, and offices for Student Life, an idea attributed to Vice President of Campus Life and Student Success, Lua Hancock. Thanks to her and many other contributors, and headed by Hanbury, an architecture firm, and Williams Company, a general contractor, the CUB was able to open on time. On top of these internal improvements, the new CUB will soon feature solar panels on its roof, which will begin creating power for the building “sometime mid-February or March,” according to Al Allen, Stetson’s associate vice president of Facilities Management, quoted in a Stetson Today article. Before President Libby took out oversized green scissors and cut the ribbon in front of the CUB, the gospel and cultural choir performed, singing “Lean on Me” by Bill Withers. It was a fitting conclusion to a day of dedication for the Carlton Union Building, one that was created with the help of so many.